"Create and edit PDF documents and fill out forms with Foxit Reader." Looking for a solution to your PDF woes? Foxit Reader is a great PDF creation, editing, and viewing application that should come standard on all PCs. The application's new and improved user interface feels very inviting and mature. Create and edit forms that can be shared with anyone. 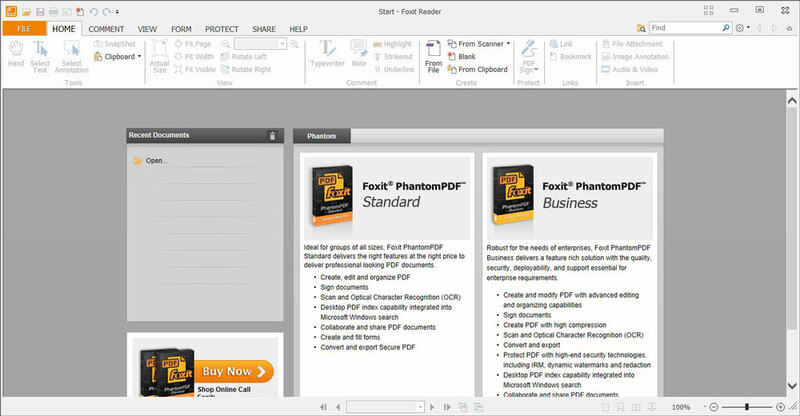 Creating a PDF has never been easier than it is with Foxit Reader. The application brings 4 different ways to create PDF applications. Users can create a blank PDF that can be edited within the program itself, create PDF files from other file types and programs/ applications such as Word documents or spreadsheetes, scan a document using your in-home scanner, or paste a document from you computer's clipboard to be saved in PDF format. Creating and filling out forms is a breeze with Foxit Reader. You can easily create professional forms and send them off to be filled out and/ or signed. You can also fill out forms that were sent to you. No more printing and re-scanning forms just to fill them out. Bypass the barrier with Foxit Reader. The new interface of Foxit looks very similar to the new Microsoft Office 2013 suite. The colors are very flat and minimal. There are many quick settings and toggles that you can access just by visiting the all new and improved quick bar. The inclusion of the Quick Settings and toggles in Foxit Reader allow you to be more productive and save time in your work. Download Foxit Reader today and improve your PDF experience.